AMOSUP is marking another milestone in the provision of medical welfare to its seafaring members and dependents, with the expansion of Seamen’s Hospital Manila. Soon to rise on a 786 sq m property next to its main facilities in Intramuros will be a three-storey hospital building that will cater to the health and medical care of the Union’s growing membership. 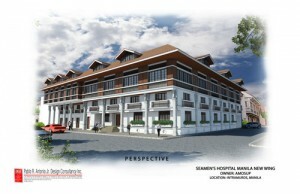 The new Seamen’s Hospital Manila South Wing building is to provide its members with bigger surgery rooms, dialysis and intensive care units, and clinical laboratory to serve their needs. Holding its ground breaking ceremony last 28 November, which was attended by ITF secretary general Stephen Cotton, maritime coordinator Jacqui Smith, IMEC chairman Rajesh Tandon, IMEC CEO Giles Heimann, shipowners, crew managers and other social partners in the industry, the occasion also commemorated the 88th birthday of AMOSUP founder and former president Capt Gregorio Oca. President Dr Conrad Oca noted that it was a “dream come true” as it took many years to realise the expansion plan of the hospital since his father planned to acquire the property years ago. Construction of the hospital is expected to finish after a year. AMOSUP vision of health care programme for Filipino seafarers traces back from its humble beginnings in the Port Area in 1974, to the Roberto S Oca Workers’ Clinic in 1980 and finally the Seamen’s Hospital Manila in 1986. To date medical and dental services for the members have greatly improved. Dr George Pile, the Seamen’s Hospital Manila medical director, noted that the union’s hospital has grown through the years to be a well equipped and professionally manned tertiary medical facility. “Our consultant doctors who were trained here and abroad in their different specialties, hospital residents, nursing and allied medical staff, who give their best to provide the best medical care for our AMOSUP members and their dependents are the backbone of what the hospital is now,” Dr Pile stressed in his opening remarks at the groundbreaking ceremony. Thanks to the visionary leaders of AMOSUP and their industry partners, other Seamen’s Hospitals have been established in Cebu in 1997, Iloilo in 2005 and Davao in 2008. In addition, an AMOSUP satellite clinic was also started in 2013 to serve union members in the northern part of Luzon.